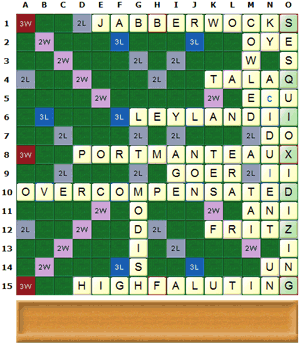 A Scrabble enthusiast has found what is believed to be the highest-scoring move found so far, possibly the highest-scoring possible: "SESQUIOXIDIZING", for 2,044 points. Of course, actually having the board in a state where this can fall into place would require quite a bit of luck, to say the least. Hasbro take legal action to shut down Scrabulous. I'm surprised it took them this long. I wonder whether they'll be smart enough to come to a deal, either acquiring Scrabulous or licensing it in return for a share of the (considerable) ad revenue, or whether they'll just sue it into oblivion to teach them a lesson, undoubtedly cheered on by the Ayn Rand fanboys loudly defending anything they may choose to do in the comments. The Scrabulous servers are in India, which may be hard to shut down, though Facebook could block the application immediately. And the authors should probably avoid any country with an extradition treaty with the US unless this is settled. The next version of SimCity will include global warming, brought in in collaboration with oil company BP. Players will be able to choose how to power their cities; if they choose cheap, dirty, carbon-intensive forms of energy, their carbon ratings will rise, and eventually bring about natural disasters. However, players can avoid that by using various BP Alternative Energy-branded low-carbon power options. Nice bit of greenwash there. Rumour has it that the subsequent version of SimCity will tackle the obesity crisis, by causing your city's obesity levels to rise and health costs to spiral unless you build McDonalds Healthy Eating™ restaurants. McDonald's: The Videogame. A simulation of running a fast-food corporation that's like Sim City, had it been written by anti-globalisation activists. Bulldoze rainforests and villages, brainwash children and corrupt officials or go bankrupt. Play it before the lawyers kill it. I saw a very large and untapped market, which is the entrepreneur's dream. There was no real venue for social games. Games got violent in the mid 1980s... that lost women. Then they got long-form and complex. That lost the casual gamer. I think Sony shot themselves in the foot... there is a high probability [they] will fail. The price point is probably unsustainable. For years and years Sony has been a very difficult company to deal with from a developer standpoint. They could get away with their arrogance and capriciousness because they had an installed base. They have also historically had horrible software tools. You compare that to the Xbox 360 with really great authoring tools [and] additional revenue streams from Xbox live... a first party developer would be an idiot to develop for Sony first and not the 360. People don't buy hardware, they buy software. The strange, intensely paranoid world of Mafia, a former psychology experiment turned parlour game popular amongst writers and the like. Here's how Mafia works: The party gathers in a room. Everyone is instructed to close his or her eyes, and three people are secretly selected to be in the "mafia" by the game leader, known as "God" or "the Mayor," whose job is to manage the action. No one knows who the mafia are except the mafia themselves, who are allowed to identify one another by opening their eyes. Later, when the whole groupcalled "the village"collectively opens its eyes, they are launched into the game: Through conversation, argument, questioning and accusation, a freewheeling group inquisition takes place to root out the mafia and kill them before the mafia kills the villagers.